I've been set a sample exercise by my supervisor, and I'm totally lost as to where I should be heading. What I've been tasked with is to generate two histograms that approximate Gaussian PDFs. Then, I'm meant to shift the means of the histograms so that they overlap to some extent, and then calculate the drop in mutual information. I've tried a variety of solutions, but none have given me reliable results so far. What I'm now trying to do is calculate the entropy of each of the histograms, and subtract the entropy of the joint histogram. However, even this is becoming difficult. From my (albeit limited) understanding of information theory, the above should have calculated the information "contained" within the first and second histograms, and summed them. I would expect a value of 1 for this sum, and I do indeed achieve this value. However, what I'm stuck on now is determining the joint histogram, and following from that, the joint entropy to subtract. 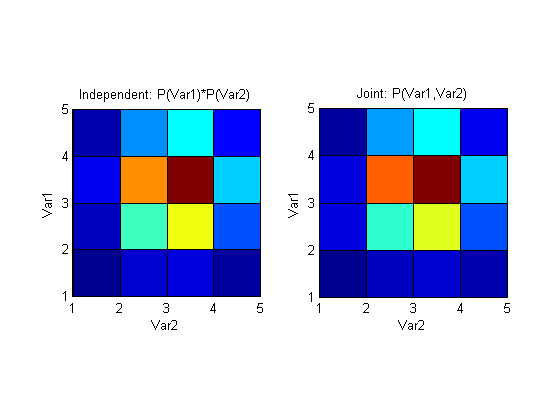 Is the prob2D matrix I've created the joint probability?? If so, how can I use this?? Any insight or links to relevant papers would be much appreciated - I've been googling quite a bit, but I haven't been able to turn up anything of value. I12 becomes much larger (~0.25) and represents the larger mutual information that these variables now share. 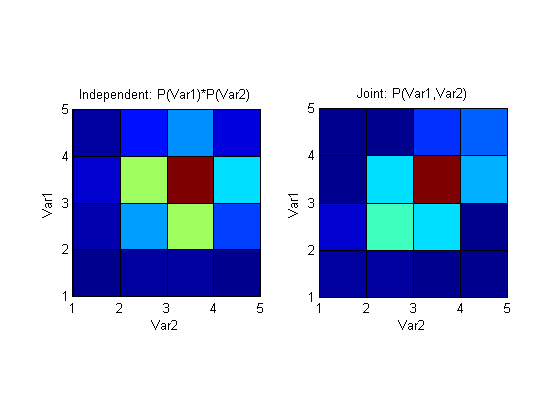 Plotting the above distributions again shows a clear (would be clearer with more points and bins of course) difference between joint pmf that assumes independence and a pmf that's generated by sampling the variables simultaneously. Not the answer you're looking for? Browse other questions tagged matlab histogram information-theory mutual-information or ask your own question. How to smooth histograms with bins 1, 2, 4, … wide? How to compare joint distribution to product of marginal distributions? Is there an upper limit on the number of intervals in a histogram? How can I compute mutual information of continuous random variables from discrete samples? Is continuous mutual information the correct analogue of the discrete version?